Drew Curtis, Airplane Series, Ink, 11 in X 14 in, 2006. Drew Curtis, Winged Figure, conte crayon, 11 in X 14 in, 2005. 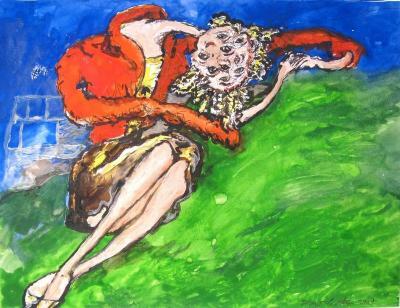 Drew Curtis, Figure, Watercolor/gouache, 11 in X 14 in, 2005. Drew Curtis, Y with Fish Bishop, Ink, 11 in X 14 in, 2005. Drew Curtis, Portrait of Y, Ink, 11 in X 14 in, 2005. Drew Curtis, Full Moon, conte crayon, 9 in X 12 in, 2005.